1. check your power cord and remove the blade. plug it in and see if the motor works. 3. clean and wax the table and fence. there should be no lumps bumps of crud. these will damage your work or make it difficult to control. 5. run a test cut and see how it goes. Craftsman 8” saws date at least back to the 50s. My dad had one. You will find 8” blades somewhat hard to locate. My dad’s had a 1/2 hp. Dunlap motor, and was belt drive. Biggest weakness on those saws is the fence. Also, in cutting anything over 1” thick, we were always finding it underpowered, and it tripped the built-in overload quite often. Can’t say I ever missed it. The saw isn’t ideal for woodworking, but is likely the best one you’ve got at the moment, and should suffice to get started. I can’t overstate the importance of good alignment of the blade and fence, and the blade selection to overall performance, but especially to a smaller saw that could be a tad underpowered, so will reiturrate the good advice you’ve gotten already. Do you know if that saws has a standard 5/8” diameter arbor, or is it 1/2”? If it’s 1/2”, it could get even harder to find blades…in that case, getting blades with 5/8” bore and a reducer might be the past of least resistance. Another option is to clean An sell ur saw and go buy another. I “upgraded” from a small direct drive delta to a craftsman 113 10inch. Night and day difference. Menards sells a real good looking master craft table saw for around $450. I bought (and used) one of these in the late ‘80s. did I say the fence? it will cut a 2×4 IF you have enough patience, but it’s best suited to 1” or smaller pine. use it while you save for a better saw. These saws have so many shortcomings that you need to compensate for that you are forced to REALLY slow down and think about what you’re doing. This will give you even more time to save for an even better saw :-D You’ll also learn more about what you like (and don’t like) in a saw. I learned a LOT about what I wanted from having to make this sub-standard saw work for me. My next saw was a contractor saw with a uni-fence. Talk about an upgrade! do not sell it under any circumstances. There are far too many cheap tools that were bought new by the unknowing (like me, back when). They’re now out there cluttering up the used-tool market so badly that new woodworkers have a hard time finding the good tools. 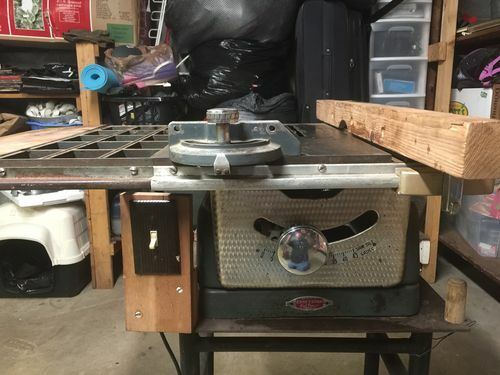 Dismantle it and recycle it when you’re finished with it or add an 8” sanding disk to it and call it a bench sander (which is what I’ve done), just please don’t let it back into the wild! I say play with it while you have it. If you get another saw later you could dedicate it to a dado blade. I disagree with the concept of taking it apart and recycling it. A working tool is a working tool and someone with little money would still want that saw, even if it is flawed. Thanks for the replies. The table saw is in working order. It can use a new blade. 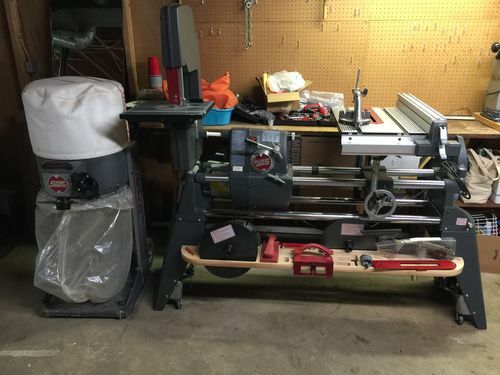 I want to be able to make some nice projects and not sure if this saw will be able to do that. I’m not sure if it has the original motor on it, but it does have a craftsman plate on the motor and rated at 1 hp. Here are a couple photos of the saw along with the band and scroll saw I got with the table saw. replace it when you better understand what you like and dislike about it, and you better understand what type of projects and work that you’ll be doing most. The Band saw is a Delta, not a Craftsman. Nice little saw. Back then there wasn’t always a thing such as ‘original motor’ because they were usually bought as an add on. You could buy a saw without a motor if you already had one on hand as well. That tablesaw has a nice cast iorn top. 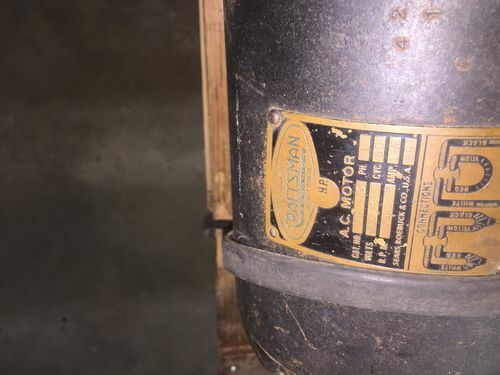 If the motor is replaceable, it is easy to slap on a better one. Also the fence is replaceable too. I know Biesemeyer used to make on that would work on it. I am not sure if they still do. I have seen home made Biesemeyer style fences that worked perfectly. 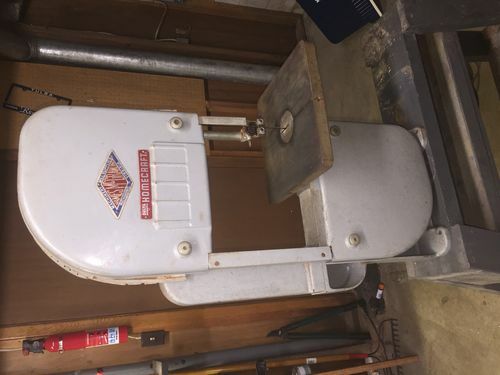 I have a friend who is about to retire and just down graded to a bandsaw similar to the one you have. It looks like the start of a lot of fun. I took my Dad’s 8” Craftsman with me when he moved, basically my first table saw. It looks mostly like the one in your picture, but with a different cabinet (early 70’s). The fence was the biggest pain, had to use a measure at the front and rear of the blade to ensure the fence was square before locking down. You can easily use circular saw blades (7-1/4”). I wanted to thank everyone for their advice that they gave. After giving it some more thought looking around I stumbled across the Shopsmith Mark 5 520 that was too good to pass up. 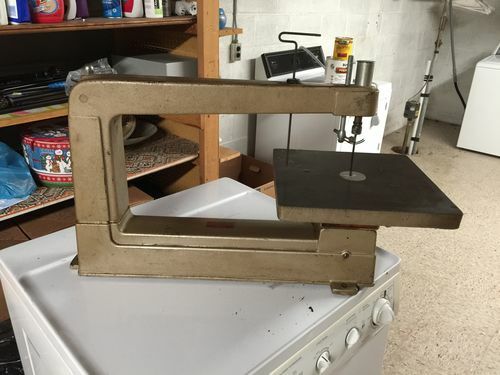 An older gentleman used it for a couple years before building a nice woodworking shop with plenty of room for all separate equipment. This was just sitting in his building not being used for the last 6 years. So hopefully this will get me started working on some projects. Not pictured is the belt sander attachment and a brand new slide table still in the box.